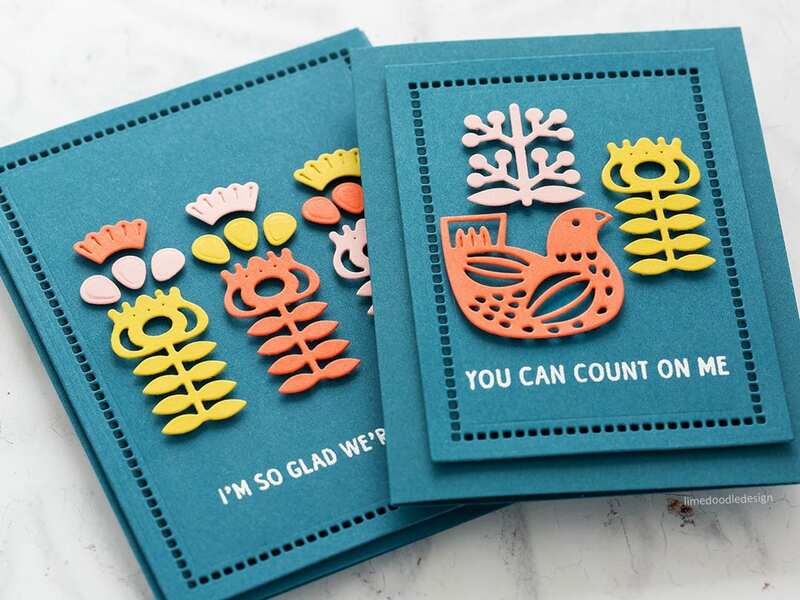 I love folk and Scandinavian style art and I thoroughly enjoyed experimenting with design and colour inspired by the Print & Pattern Nature book for my trio of cards. 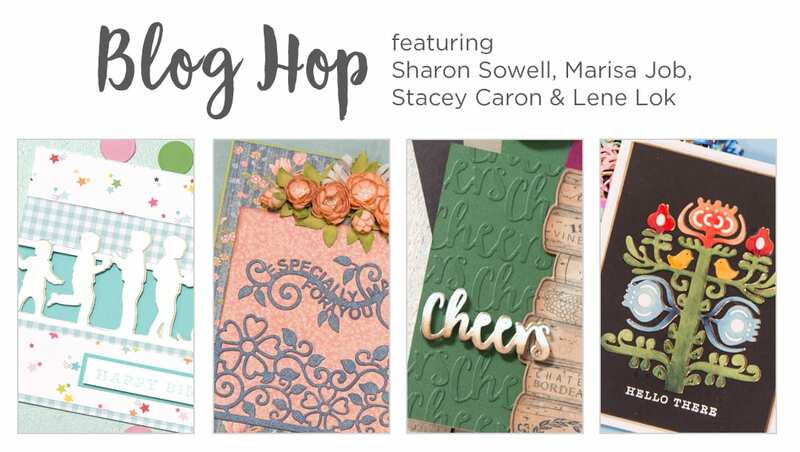 Also, I’m delighted to be joining Spellbinders today for their April Blog Hop, more details on that below. I’ve linked all supplies at the end of this post. Compensated affiliate links used. 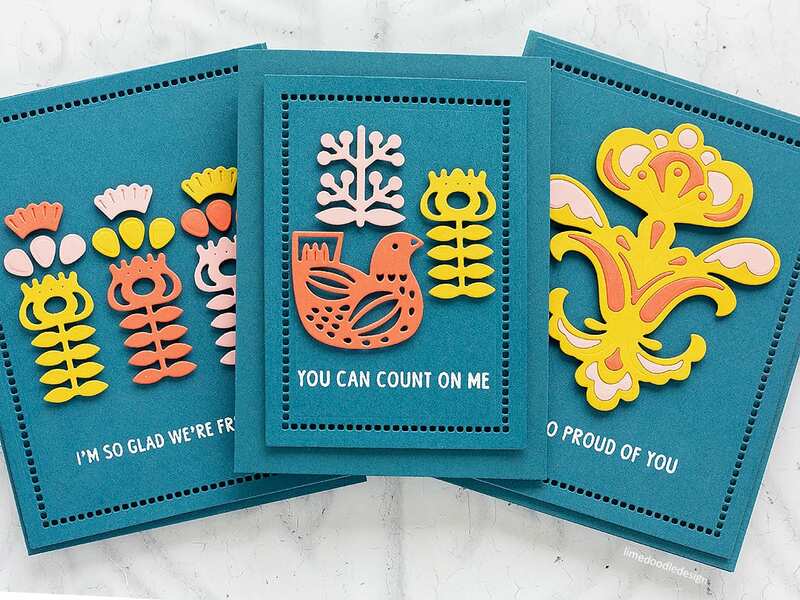 I started this trio of cards by raiding my stash of cardstock and picking colours that matched those I’d found in the Print & Pattern Nature book. Another great resource for colour combinations is Pinterest and I keep a Pinterest board solely for inspiring colour palettes I’ve seen. Unfortunately, I’m a bit of a hoarder and I’m not sure where these card colours came from. I wanted to have a dark colour as my base and so I picked the deep blue colour and scored and folded card bases. I also die cut panels with the Hemstitch Rectangles dies too. I used the Platinum die cutting machine and then the handy Tool ‘N One made getting all the little pieces out of the holes so easy. I stamped sentiments from the Neat & Tangled So Many Sentiments set in clear embossing ink and white heat embossed. 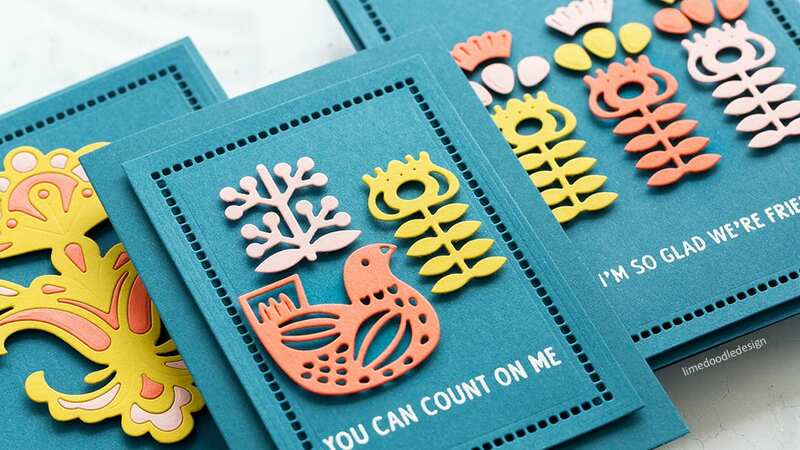 I then die cut elements from the Nordic Blooms, Nordic Floral, Kurbits 2 dies from the chartreuse, pale pink and coral card and arranged them on the panels. I layered all the elements with foam adhesive – the panel onto the card base and the colourful die cuts on top. These cards were so simple to put together and yet their colours and folk design pack a big punch. I think with a simple design like this, that keeping everything nice, clean and crisp helps with the overall impression and these dies from Spellbinders cut so cleanly and with deep impressions that they really helped give the card a polished feel. As mentioned above, this post is part of the April Spellbinders Blog Hop. 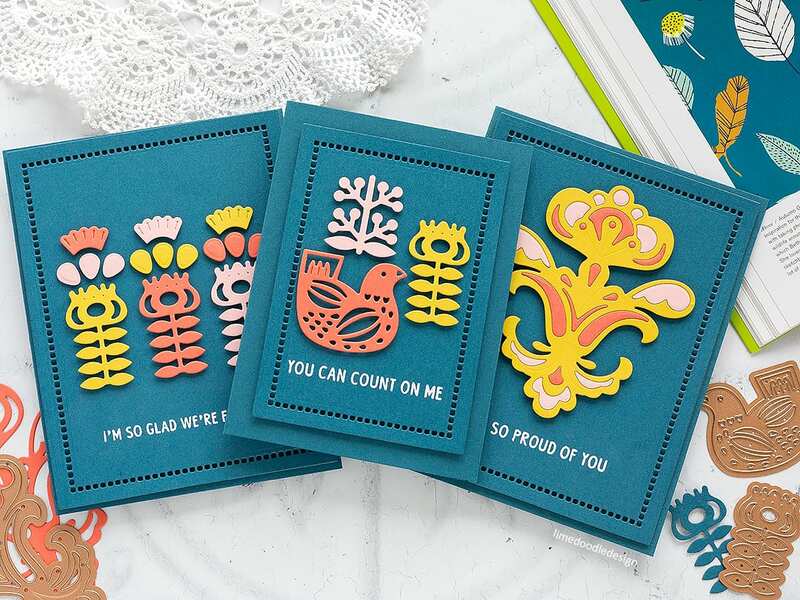 Hopefully, you’ve arrived here from the Spellbinders Blog, but if not then a good place to start. To celebrate this release, Spellbinders is giving away a $50 gift certificate to a lucky winner. Please leave a comment on Spellbinders blog by Sunday, April 22nd 11:59 pm EDT for a chance to win. The winner will be announced in the blog hop post on Spellbinders blog the following day. The winner is responsible for shipping cost, duties and taxes. Also, I have a $25 gift certificate to give away from comments left on this post. Please leave a comment by April 24th 11.59pm EST. The winner is responsible for shipping cost, duties and taxes. Spellbinders Folk Art at SSS! So pretty1 I love the bright background & the authentic folk art look! 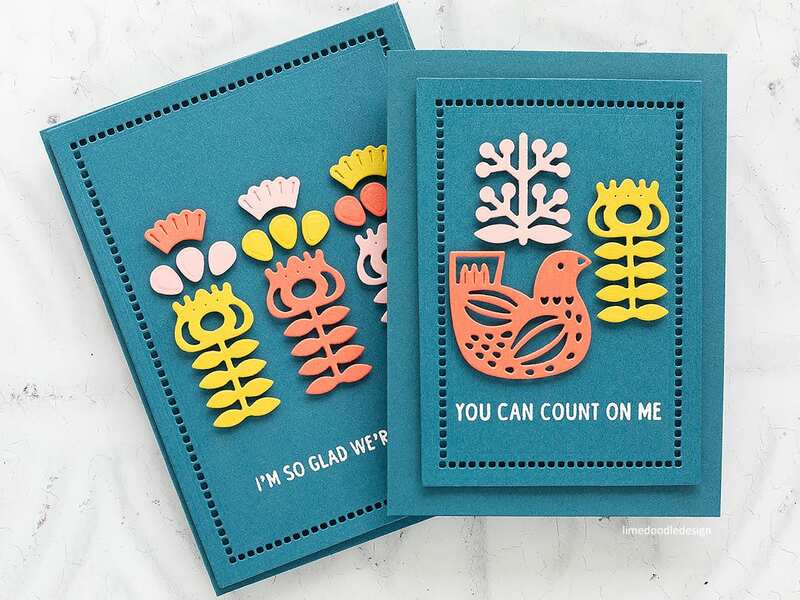 Love these designs and your pretty color combos! How beautiful are these designs and color combo !! Congratulations !! Your cards really make these products shine. Fab colour palette.